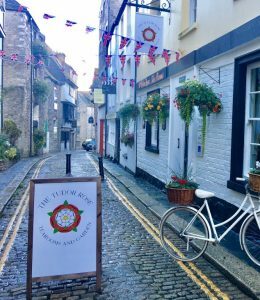 On one of the oldest streets in Plymouth, situated within one of the beautifully historic listed buildings on New Street, which is located on the Barbican, The Tudor Rose Tearooms and Garden can be found. At the Tudor Rose, every day is begun with the air being generously filled with the scent of our delicious fresh baking, the appetising aroma will not let you resist as we lure you in to try our traditional yet delicate freshly baked treats. Relish in the moment and choose to savour one of our exquisite locally sourced loose leaf teas to suit your individual taste or enjoy a perfectly poured cup of coffee within the comfort of our vintage English tearoom. All our coffee is roasted in the West Country and freshly ground by us at the Tudor Rose. Why not try our signature “New Street Sandwich Cake”? We are passionate about tasty home cooked food and pride ourselves on a friendly welcome accompanied by great service. Whether you’re out and about discovering the Barbican’s famous history or just on a quick break from your busy life, the Tudor Rose is the perfect stop for breakfast, lunch, afternoon tea or just a refreshing drink. Not only are we friendly to our customers, we extend this warm loving nature to our furry friends, priding ourselves on being a dog friendly café. Now you can enjoy the perfect cup of coffee accompanied by a delicious afternoon tea with the comfort of your favourite furry pal close by your side. 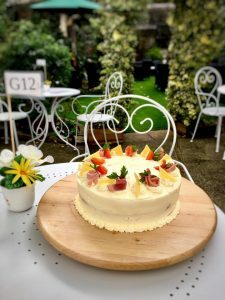 The Tudor Rose Tearooms only use trusted suppliers to ensure the best possible quality in our seasonally produced menus, we keep our food locally sourced wherever possible. We have a highly requested range of bespoke menus designed for private parties, business meetings, coach parties, special occasions and more. Love visiting our tearooms so much you can’t help yourself but keep returning to us? Well the good news is we love your loyalty! So in return, we offer loyalty cards alongside a senior, student and blue light discount. As always we look forward to giving you a warming welcome to The Tudor Rose Tearooms and we hope you enjoy your time spent with us!